US, 2016, 92 minutes, Colour. Nicolas Cage, Russell Brand, Wendi Mc Clendon- Covey, Amer Chadha -Patel, Paul Scheer, Will Sasso, Denis O' Hare, Rainn Wilson, Chenoa Morrison. Although he won an Oscar for his portrayal of the desperate alcoholic in Leaving Las Vegas, Nicolas Cage is much better known as a star of action films. This is especially true as he grew older, making several action films a year. So, it is more than a surprise to find him here and something of a shock to see his portrayal of Gary Faulkner, who is seen in the final credits with scenes that the audience has seen in the film as well as some interviews with him. In fact, Nicolas Cage has to be seen to be believed. Full in the face, grey hair and ponytail, thick beard, incessantly talking, incessantly loud, with a physical condition that needs dialysis, with a mental condition that has him in institutions, this is quite a characterisation. But, the director is Larry Charles, best known for his television and film satire, producing and directing such shows as Curb Your Enthusiasm as well as Seinfeld and series like Entourage. His main films have been the vehicles for Sasha Baron Cohen (who might have been very interesting in this role as well): Borat, Bruno, The Dictator. The film indicates that this is based on a true story – or, possibly, an element of truth. Gary Faulkner lives in Colorado, is a handyman along with some friends. He is obsessed with 9/11 and the search for Osama bin Laden, feeling desperate that the Americans have not found him. As part of his mental condition, he has visions of God who gives him the mission to find bin Laden. And, God is seen in the person of British comedian, Russell Brand, his accent, his wild hair looking a bit like traditional Jesus pictures, his particular comedic style with its language, more than rough edges, satire. And yet, beneath a lot of the comedy and the witticisms of his dialogue, there are quite a number of theological elements that audiences can respond to, especially about the nature of the knowledge and power of God, creation, omnipresence, interventions – and the issue of human freedom and free will. Gary Faulkner makes several attempts to find bin Laden including buying a dilapidated boat, setting sail from San Diego, turning a few circles and landing on the beach. He decides to hang glide from Israel and cuts up the hang gliding mechanism despite advice against it and crash lands, breaking a lot of limbs. When he gets despondent, God continues to appear, challenging him and he finally goes to Pakistan. The sequences were filmed in Morocco – and there is some observation of life in Pakistan as well as some touches of parody. 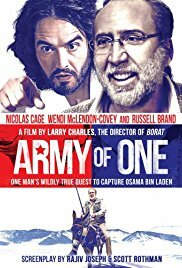 Denis O’ Hare and Rainn Wilson appear as CIA agents in Pakistan who deport Gary after he has a dream about finding bin Laden in his cave, confronting him (and bin Laden not understanding his ideas at all) and their having a sword fight. In the meantime, Gary meets an old friend back home and has a relationship with her and is very good to her niece who has cerebral palsy. Eventually, President Obama announces the attack on bin Laden – but, Gary, in the tradition of American conspiracy theories, says that he may not be dead because it is alleged that he was buried at sea and, therefore, there was no body. Audiences may be put off at first by Cage’s a touch hysterical performance but the film is worth persevering with, has quite a lot of funny moments and, released in the year just before Donald Trump took office, might seem a touch more real than when the film was first written and produced. 1. The premise of the film? A true story? The truth? Element of truth? And the images of the actual Gary Faulkner at the end of the film, interviews with him, his mission and his perspective? 2. A piece of Americana? Cinema of the absurd? The tradition of satire on military issues? Yet the realities of the 21st-century, 9/11, the invasion of Iraq, the consequences in Iraq, the war in Afghanistan, America’s involvement in uprisings throughout the world? 4. Americanism, making America great again, the critique of the search for Osama bin Laden, American patriotism, rugged individuals – yet madness and mental conditions? And the actual finding of bin Laden and the announcements by President Obama? 5. The opening, Gary and his hang gliding into Pakistan, the American flags on the wings? 6. The presence of Nicolas Cage, his career in action films, action hero? A different kind of performance, manic, extroverted, incessant talking, mental? The impact of Cage’s performance? 7. The work of the director, his satirical work, writing and directing? This film in that tradition – satire on America, on the world? 8. The introduction of God? Having Russell Brand as God? His look – touch of traditional images of Jesus? His English accent? His jargon, swearing, ironic comments? The quotations from the Bible? The discussions about the nature of God, omniscience, omnipresence, all-powerful? The comedy of the various places in which he appeared? In reality, visions, on the television? In the bar? Television interviews? The thought behind the dialogue for God – and raising all kinds of theological implications, the role of God, creation, Providence, human free will…? 9. The introduction to Gary, his character, manner of speaking, all-American? His physical condition and the dialysis? His mental condition, in the institution, the incessant commentary? At home, his friend turning him out? Yet the continued friendship? At the bar, drinking, workers handymen? 10. Gary and his obsession about bin Laden? God and his apparitions, giving him a mission? Gary believing it, putting it into practice? His visit to the doctor, asking for the money for the boat, the doctor’s refusal, giving him the money for the ring – and this later being exposed on television? The deal for the boat with the pot-smoker? Trying to equip it? The official and his argument with her about parking the boat? Setting sail, the map, his going in circles, landing on the beach? 11. The past friendship with Marci? Meeting her in the supermarket? The visit? Lizzie and cerebral palsy? Gary and his instant ability to relate to Lizzie? The attraction to Marci? The sexual relationship? Gary being uninhibited? 12. Marci and her patience, listening to his plans for finding bin Laden? Her care for Lizzie? Her own needs? 13. Gary buying the hang glider, the advice of the shop attendant, his cutting it up in pieces, trying to get it on the plane? His buying the sword, God on the shopping channel? His practice, slicing the fruit, Marcy and her success? At the airport, their refusing to let him take it on the plane – and God intervening? 14. On the plane to Israel, the hang gliding, the little boys, taking off, the crash, the broken bones, return to America, recovery? 15. The temptation to give up? God and Gary’s intense experience of him and the mission, especially the encounter in the bar and God challenging him? 16. The visit to Pakistan, the sword, his making friends, helping the man with his takeaway food and getting the crowds, the taxi ride and talking about bin Laden, his room, the muezzins and his waking up, examining the woman in the burqa, seeing the women in burqas exercising – and the screenplay providing a lot of insight into Pakistan as well as some parody? 17. The days passing, their being numbered? His failing in his mission, sense of depression? His dreams, God? Bin Laden and the conversations with him? 18. The CIA, the chief, suspicious attitudes the assistant, his enthusiasm to find Gary, wanting to go undercover himself but too tall? Their eventually getting Gary, the interrogation, their getting nowhere? Wanting to support him? 19. Gary, the dream, in the mountains, with the taxi, pursuing the man, finding the cave, on dialysis, the discussions with bin Laden, bin Laden not understanding anything, their fighting with the swords? His waking up? 20. The return home, with Marci and Lizzie, always bringing gifts? The possibility of settling down? Watching the mission against bin Laden on television? 21. Gary, the conspiracy theory, bin Laden buried at sea, therefore not dead… Americans and conspiracy theories? 22. The film as funny, parody, critique of America, yet the serious undertones?